Joan Lowery grew up in Hollywood, California. She attended Hollywood High and the University of Southern California, where she majored in journalism and met her future husband, Hershell Nixon. She was a writer since very early childhood, and was first published at age 10, when one of her poems appeared in a children's magazine. She sold her first article to a magazine when she was 17. After college, she became interested in writing fiction and went on to produce more 100 books. 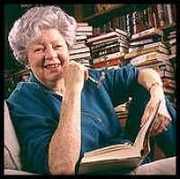 Her books for children and young adults ranged from picture books to mysteries to historical novels. Joan Lowery Nixon won awards for her writing in all genres, but was especially recognized as a mystery writer -- she was a four-time winner of the prestigious Edgar Award from the Mystery Writers of America. Joan Lowery Nixon is currently considered a "single author." If one or more works are by a distinct, homonymous authors, go ahead and split the author. Joan Lowery Nixon is composed of 9 names. You can examine and separate out names.